So, you’re looking for a new gadget to help with your training, increase your motivation and track your training more accurately. The increased interest in wearable tech has made the decision making more difficult than ever, so ShoeGuide.Run have put together this quick guide to what we think are the best running watches on the market. Let’s face it, most of us are not at Mo Farah standards, but I do daydream sometimes on a run, where we push ourselves to the limit each day, requiring accurate data to assess our progress and recovery. The reality is, any data we need from our device is pretty basic so we are going to do our best to cut through the brand marketing and make some simple comments on watches that we have worn ourselves, to provide you a list of the best value, most useful watches on the market today. Our results are based on the basic principles we have learnt over years of elite competition, training day in day out to improve our personal bests but mostly because we love to run. My strongest opinion on this article is, a GPS Watch is an amazing bit of kit to help you improve as a runner, and a superb motivator – especially once data is downloaded into a training diary (more on this later), but it is not the be-all and end-all. A run without a watch, without the information overload, and without clock watching is probably the most important run you can do. Run to your body not time, and enjoy to fact you have the freedom to step out the door and feel amazing is vastly under-rated. Absolutely, get your perfect watch, but do not feel obliged to wear it for every run. There are far too many watches to mention in one article, due to the current popularity of wearable tech, with every brand offering multiple versions at increasingly complex and technical specifications. Sensors for everything. Pick your priorities as you will pay for each one and you can end up buying something with features you do not use. Different shapes and sizes. If it’s a running watch you need, look for a slim, light watch. It will be way more comfortable. Stalk Me. 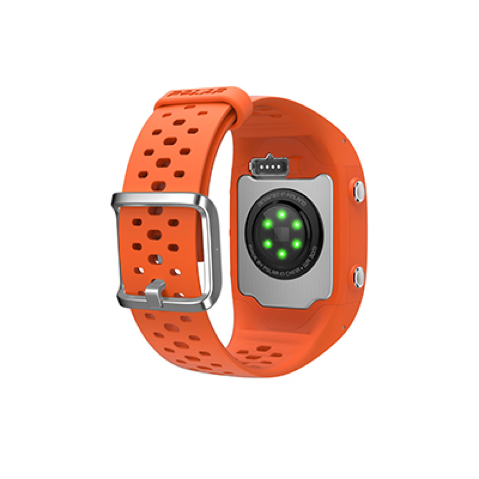 Some watches allow someone to track you during your run, keeping you safer. Kinda cool eh! Notifications. Its modern life, who would not want their messages and calls on their wrist and interrupting a lovely run. You can also switch then off by the way! Here is a list of our favourite running watches on the market right now from each brand, obviously in order of how much we like them. Amazing for any runner with a budget. The Forerunner 235 is our stand out favourite running watch right now. Priced at $299 but easily found online for less, Garmin are masters of GPS, and this watch picks up a tracking signal lightning fast with GPS and GLONASS satellite compatibility (a bonus when your stood in the cold and rain with your arm out looking for signal). It is a compact and very light watch, like a running watch should be (which isn’t always the case with a GPS watch) and can easily actively track for over 10 hrs on one charge. Wrist based heart rate technology measures heart rate 24/7, giving you the option to run without a strap and seamlessly train in HR zones that can be pre-programmed according to your fitness level. The interface on the screen is highly customisable, allowing you to see a variety of data while on your run, which I tend to keep to the basics of Distance, Pace, Timer and HR, then delve deeper into my performance on the Garmin Connect interface post run. 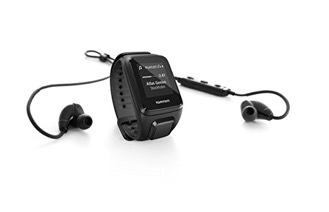 Garmin Connect, is easily the best data interface from any GPS watch brand in our opinion, with its layout, ease of use and downloadable information being second to none. 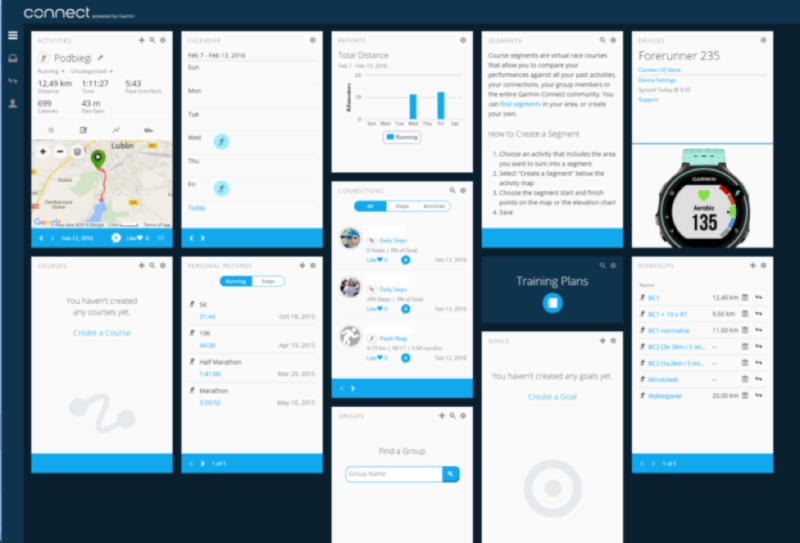 Concise, easy-to-understand charts, graphs, route maps and more let you view your activities, document progress toward your goals and wirelessly upload and share relevant data directly with the online Garmin Connect network. We compete with each other and share data so there is no shirking going for a run, its almost as good as your mate knocking on your door and dragging you out the door, but not quite. Key here is any watch can track your run, but its what you can do with your data afterwards the makes a Garmin watch stand out for us right now. 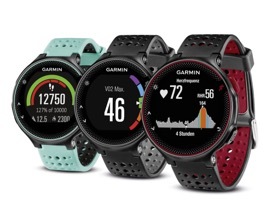 The Garmin Forerunner 935 is worth a mention here, as it is an insanely good watch with a price tag of $499.99, but it is not in our top 5 as we don’t believe the technology in the watch is worth the extra money over a Forerunner 235 for a runners watch. Now if you are a multisport athlete, especially a Triathlete, then it is a TOTALLY different scenario, and the Forerunner 935 is absolutely our go to product. Its ability to provide advanced dynamics information for running, cycling and swimming, including ground contact time, balance, stride length and more make this a best in class product. The Polar M430 makes it on the list as this is, in our opinion, one of the better smart watches for tracking your Heart Rate, with a great quality optical HR sensor. Polar have not just put one sensor on the watch but a circular arrangement of six LED sensors, which if you manage to wear the watch in the correct position (something that is not always easy with a HR watch) delivers some of the most accurate data of any product worn even in colder weather, which notoriously affects accuracy. We would even suggest this may be the best optical sensor out there. For a price of $229, that makes the Polar M430 a great value piece of kit, with a high end HRM. The Polar M430 definitely is not the best looking watch, which is an issue for a day to day watch (then again any sports watch isn’t a Tag Monaco), but other notable positives of the Polar are its Flow App interface that allow compatibility with different platforms inc nike+, Strava, My FitnessPal and Apple Health, so it automatically uploads data to your preferred area. But again, the software is a little light on analysis compared to Garmin. You can also alter the GPS recording rate, creating significantly better battery life, which was very handy when travelling and forgetting the charging cable. There was never an issue with the GPS accuracy, so no complaints there, and the satellites were found in under 30 seconds, most times it was used. Overall, there are not too many negatives with the Polar M430, but it gets put down the list because as a RUNNING watch it is nowhere near as nice to wear, or read the display on a run as the Forerunner 235, but if your priority is to track your Heart Rate as part of your training coupled with an impressive array in built features, then the Polar M430 would be very hard to turn down as your best option. Dutch brand Tom Tom are market leaders in European Automotive Navigation devices, so naturally have superb GPS technology, making them a logical brand to enter the wearable industry. Tom Tom running products have been improving drastically season on season, to a level where the watch technology is now as good as any brand. If you are in the ‘running with music’ camp, the Tom Tom Spark 3 is an absolute must have product. Add up to 500 songs directly on the watch easily from your computer and link to Bluetooth headphones allowing you to leave your oversized smart phone at home and enjoy a run without a brick attached to your arm! How liberating. This modern versatility of music payback, and a superb watch with added ability to upload routes and finder options that will never get you lost, make this an all round powerhouse of a product. 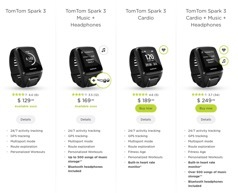 Note, the Tom Tom Spark 3 Cardio versions have the built in HRM, which is supplied by a 3rd party company LifeQ (a HR specialist) so its has good reviews, but we didn’t test this version, however John did listen to The Smiths on the Spark 3 Music version. There are 4 versions of the Spark 3 in the range, but the stand out reason for a Tom Tom watch is its ability to store and play music (Tom Tom Spark 3 Music $169). If you are not in the market for a music device – we say go for the Garmin Forerunner 235 for run-ability. Ok, lets start with a little honest reasoning – this watch would easily be my number 1 pick, its an absolutely stunning watch, and I love it. Suunto watches are premium quality, extremely durable and easy to use. But as a runner, wanting a running only watch it would not be my first pick - Packed with amazing features, such as weather analysis, incredible tracking capabilities to keep you safe, prepared, and on the right path off road, an altimeter measuring your vertical climb (and ironically I tested this device in Amsterdam where on average I gained 2m elevation over the whole run) and even a bike power meter make this product and most other Suunto products too bulky and heavy to be an everyday running watch. Its very big on my wrist and its not the most comfortable thing to wear on daily training runs, but it isn’t bad, it is just not practical for a race or faster training. If you are in the market for an adventure racing watch, with unbelievable off road capabilities, that would even be considered life saving at times, then this watch is the pick of the bunch. A superb piece of kit for an adventure enthusiast, but it not making the top 3 purely for its running practicality. 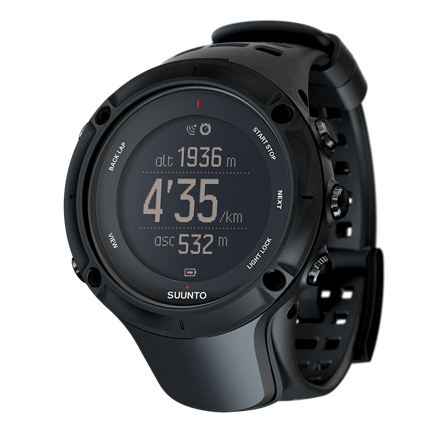 A notable addition would be the soft wear that supports the Suunto Ambit3 and all Suunto watches – Movescount, is superb. Packed with amazing analysis details, and more graphs than you would ever need, its every bit as good as the Garmin software.